For entertainers, there’s no season like wedding season. Weddings are undoubtedly one of the highest money making gigs for entertainers of all kinds. 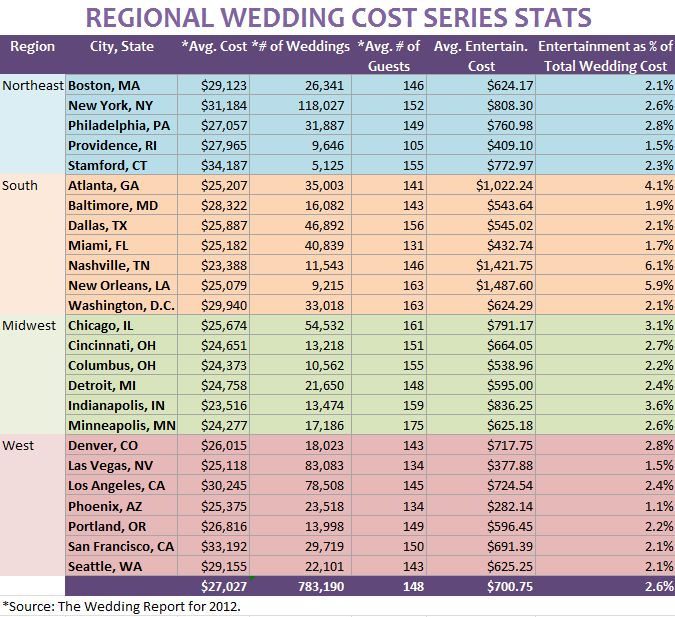 Want to see how your region stacks up to the rest of the nation in wedding entertainment costs? Check out our handy chart! With the help of The Wedding Report, we have compiled a list of wedding and entertainment costs in some of the United States’ most populated areas. Each listed city will be featured more in depth as a part of the Regional Wedding Cost series on our Wedding blog (take a look at Los Angeles and New York). We hope you as an entertainer can use this data as a helpful guide when considering the pricing and location of your next wedding gig. You might even be tempted to move to Nashville, TN, where entertainment is around of 6.1% of total wedding costs (averaging $1,421.75). New Orleans comes in a close second with entertainment costing an average 5.9% of total wedding expenditures, but entertainment rakes in around $1, 487.60! Where does your area stand? Comments about the results we found? Share your thoughts below!